You can't get away from vampires, even in the frozen reaches of Skyrim. If you thought dragons were a lot to deal with, then I have some bad news for you: Skyrim has vampires too. In the Elder Scrolls games, vampires are the result of the disease Porphyric Hemophilia, which is quite easily curable in its early stages, but much harder to get rid of once it's taken hold. The bloodsuckers were discovered by Ripten during a press event; two vampires hiding out in a cave in a mountain not far from a village, guarded by legions of less chatty undead like skeletons and wraiths. The journalist in question didn't contract vampirism, but since it's been possible to do so in pretty much every Elder Scrolls game ever made, it seems a safe bet that it will be possible in Skyrim, too. 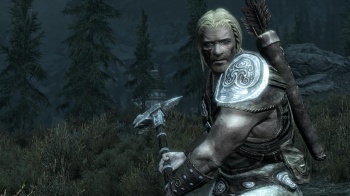 Becoming a vampire does actually have its advantages in the Elder Scrolls games: In Oblivion, for example, the player became tougher and gained new, innate powers, like being able to turn invisible and charm people. There were downsides too though, like taking damage from the sun, and having people refuse to talk to you because of your condition, so you have to weigh up whether it's really worth it.